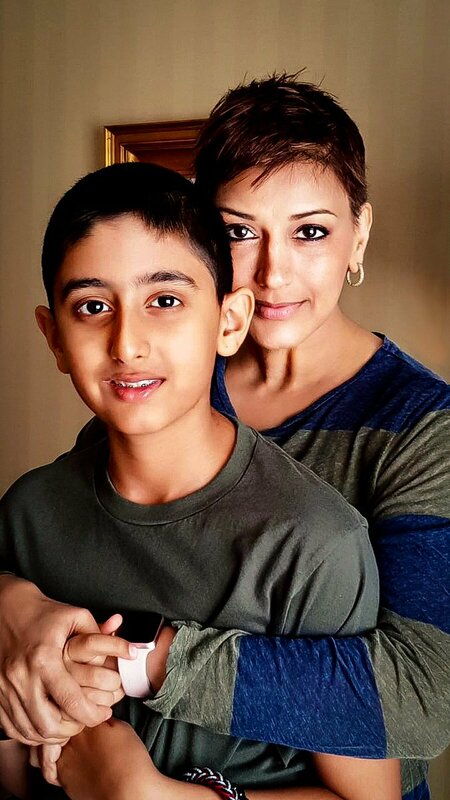 Actress Sonali Bendre, who is undergoing a metastatic cancer treatment, in an emotional social media post has shared how her 12-year-old son Ranveer dealt with her cancer news. Sonali on Thursday took to her Instagram and uploaded a picture with her son along with the post. She says since Ranveer was born, “his happiness and well-being have been the centre of anything” that her husband Goldie Behl and she did.”And so, when the Big C reared its ugly head, our biggest dilemma was what and how we were going to tell him,” Sonali wrote. They wanted to protect him, but wanted him to know the full truth.And she was surprised, “he took the news so maturely and instantly became my source of strength and positivity for me.”In some situations now, he even reverses roles and takes on being the parent, reminding me of things I need to do,” Sonali added. Ranveer is currently with his mother here during his summer vacation.”His madness and shenanigans help me switch on the sunshine. And today, we derive strength from each other,” added the actress, who believes in taking one day at a time. Post her diagnosis, the “Sarfarosh” actress is quite active on social media platforms and constantly gives updates about her health to the fans.Her positivity in these times of personal strife has been lauded widely on social media, especially when she shared a photograph in which she is seen smiling ear-to-ear as she sports a new haircut denoting that she is battling cancer with resilience. Next articleTelugu remake of ‘Theri’ called-off?